With the release of his debut album, The Journey, Chris Beck is making a name for himself on the New York scene as a hard-swinging, powerhouse drummer and composer. Beck’s refreshing and soulful vision as an artist is on full display, as is his unique ability to pay homage to the classic straight-ahead style of jazz while infusing elements of his African roots and Gospel upbringing. Born into a musical family, Chris Beck, a native of Philadelphia, PA has been exposed to music from a young age. Deciding to make music a career, he earned a Bachelor’s Degree in Music from Temple University in 2004. In 2006, Beck moved to New York City to establish himself on the jazz scene. 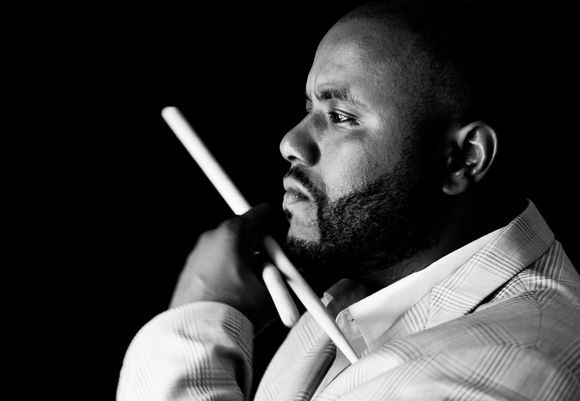 After settling in New York, he began studying with highly esteemed master drum teacher, Michael Carvin. In 2010, Beck graduated with a Master’s Degree in Music from Rutgers University’s Mason Gross School of the Arts, where he studied with Victor Lewis. Chris Beck currently performs with talented musicians such as Cyrus Chestnut, Oliver Lake, and Grammy nominated Rufus Reid. He has also been blessed to share the stage with renowned musicians such as McCoy Tyner, legendary Motown recording artist Martha Reeves and the Vandellas, James “Blood” Ulmer, The Mingus Big Band, David Murray, Billy Harper, Curtis Fuller, James Spaulding, Harold Mabern, Charles Fambrough, Mulgrew Miller, Wynton Marsalis, Terell Stafford, Tim Warfield Jr., Nicholas Payton, Roy Hargrove, Wycliffe Gordon, Orrin Evans, Bruce Barth, Nicole Henry, Jennifer Holliday, Macy Gray, Mark Whitfield, Derrick Hodge, Ralph Bowen, Joanna Pascale, Joe Locke, Duane Eubanks, Eric Lewis, and many others around the world.